About two years ago, Chef David Katz opened Meme Restaurant and started a quirky lunch special. Each Thursday, and Thursday only, Meme serves a fried chicken lunch. 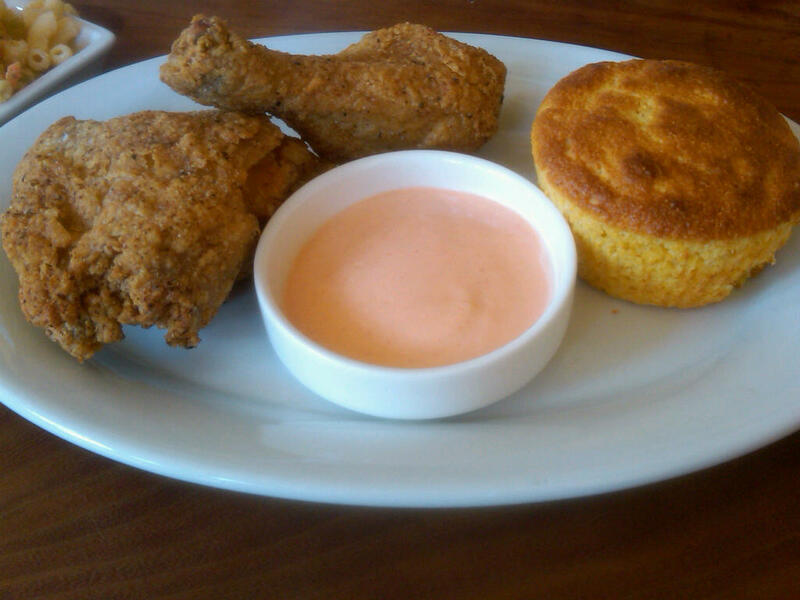 The fixed price meal ($11) includes a thigh, drumstick, cornbread and a glass of iced tea or Miller High Life. For an extra $2 you can get the side of the day. Want something besides fried chicken? Sorry, Charlie. That’s the only option. There’s something about the whole situation that creates and allure and that allure has had me intrigued for the past two years. Unfortunately, I’m rarely able to enjoy a sit down lunch mid-week and when I’m available, my husband is usually working. This past Thursday, the husband had off and I took a (much needed) mental health day. We planned on grabbing lunch at Meme before watching NCAA basketball that afternoon. We arrived at Meme around 1pm and were seated immediately. The room is small–it seems even smaller than when the restaurant’s former resident, Melograno, was there but Melograno packed that place with a bunch of tiny tables. Meme was a little more comfortable. Our friendly waitress took our order (fried chicken, duh. All she had to do was find out what type of drink we wanted and whether or not we wanted a side) while I surveyed the restaurant. The diverse clientele ranged from business lunchers to contractors enjoying an end-of-day meal. It was a beautiful and two women sat outside with young children and a large, large dog. I enjoyed seeing this unique conglomerate of Philadelphians all seeking the same thing–a decent plate of fried chicken. And decent it was. The chicken arrived in a jiffy (my research tells me he cooks it in advance so it’s not piping hot and the flavors have time to settle.) I usually tend towards the crispier skinned bird but Katz’s chicken has a thinner crust. The chicken was perfectly crispy with moist and juicy meat under the crackle of skin. My husband was a fan of the smoky dipping sauce but I didn’t want to compromise the simple, salty deliciousness of the meat. 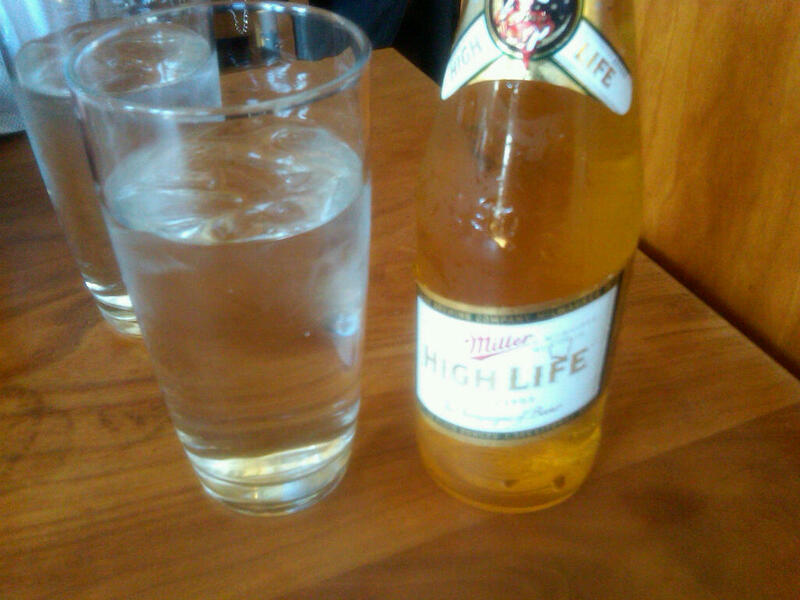 Instead, I dipped my crumbly corn bread into the dip and washed it down with an icy cold Miller High Life. Life is grand. 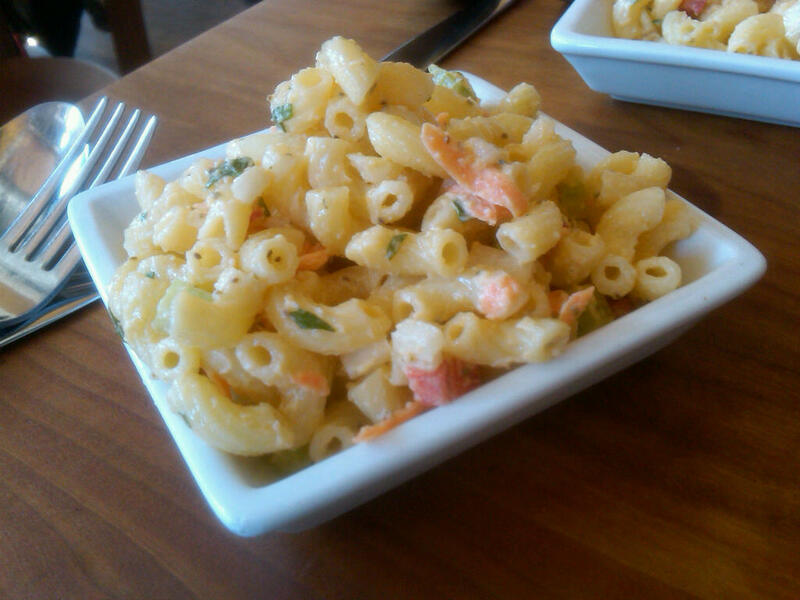 The macaroni salad was decent–not too heavy on the mayo–but the star of the meal was, of course, the chicken. Now I see what all the buzz is about. All in all, we were in and out of the restaurant in well under an hour (probably closer to 30 minutes.) My husband said it would probably be the shortest blog post ever. Chef Katz is doing great things at Meme and I love that he’s made himself accessible to more than just the typical foodie. If you’re in Center City West and have 30 minutes to spare, be sure to check it out! I just made fried chicken for dinner last night (well, Thai fried chicken)…and now you have me craving more! What is Thai fried chicken? Sounds yum! p.s. I wish we lived in the same city so we could have a dinner party. We’d have the best food!!! I like this place already due to the use of real forks and plates. Is there potato salad and, if so, how good is it? there is potato salad, but not every thursday. its very good!